Perhaps it is a sad indictment of my personality and my life so far, but few things can stir within me the same emotions, excitement and enthusiasm than the mere thought of the world’s best ever football management simulation game, Football Manager. I am somewhat comforted by the fact that I am not alone in this. There are apparently more than 11 million others, certainly not all like me, but based on this Guardian article a few months ago, there are people who’ve got it worse. I find it very hard to accept any criticism directed at this glorious game. Football Manager single-handedly ensured that I did not waste my youth and instead led Francesco Totti to Champions League glory with his boyhood club, I made Brendan Rodgers and Michael Laudrup look rather average with my title-winning Swansea side of 2018 and amassed many many more achievements that I better not list here for fear of never getting to my point. As part of the campaign to accompany the launch of the new version out in the next few weeks, developers have been slowly advertising the various new “items” set to enhance the user experience, via tweets, videos and screenshots. Taking into account the god-like status I afford the game’s developers, I may be committing an act of heresy by pointing out some possible misdemeanors in their attempt to liven up the squad training dashboard. But in the name of data journalism, I feel I have to. 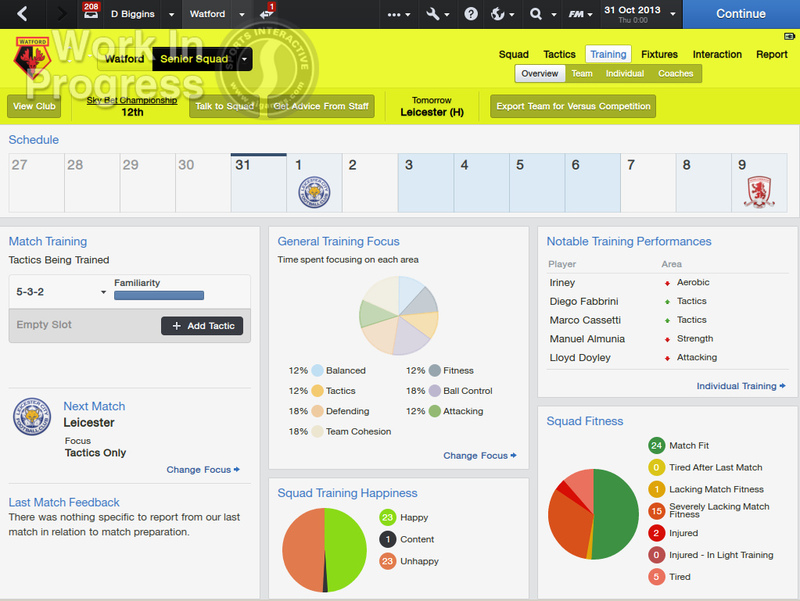 The screenshot, which indicates that it is a work in progress and not the final version, depicts levels of squad fitness, happiness and overall general training focus through pie charts. Now this is not necessarily something all that novel. Football Manager is no stranger to cool and complex data visualisations, introduced to compare players and show form a number of years ago. Adopting the naive approach that the more data viz the better, without too much thinking and with the utmost confidence in anything the football manager developers produce being of the utmost quality, overwhelmed with excitement at added, attractive-looking visualisations within the game, I tweeted away. John Burn Murdoch, experienced data journalist formerly of the Guardian datablog and currently at the FT (and later revealed to me that he was an ex-Football Manager addict), was less than impressed however. Almost in disbelief, he replied to my tweet by linking to an article on Excelcharts.com, explaining why using pie charts with more than two segments are problematic. The article simply and clearly explains and demonstrates that you should only use a pie chart when comparing a single proportion to the whole. Traditionally, pie charts are one of the most common ways to analyse data, you see them everywhere – newspapers, magazines, online in any sort of statistical analysis. They are often the go to tool for a quick and easy data visualisation, but after John’s tweet, doing some reading around the issue and looking at different examples of pie charts within the media a little more critically, it’s not hard to see that they are almost never useful in actually comparing different values effectively. 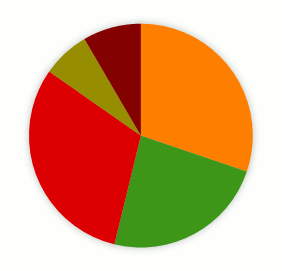 My research led me to many websites castigating the widespread use of pie charts. According to Business Insider, they are the “worst way to convey information ever developed in the history of data visualization”. I found writers wanting to report poor uses of pie charts within the UK national media to “the data viz police”. Not entirely sure they exist to be honest. However, it is nice to find someone who is prepared to accept that my reaction does not *necessarily* portray stupidity and let me off the hook for suggesting that pie charts looked rather cool. Here is what programmer Steve Fenton had to say about pie charts, making me feel less bad about my error in judgement. Since 1801, pie charts having been displaying information and statistics about everything from population to profit, market share to margins and, presumably, the most popular pastry-encased dinners. Pie charts are as popular in the statistics world as their namesakes are in the culinary world – but there are some convincing reasons to avoid using them altogether. Tell someone that pie charts are rubbish and they’ll look at you with a mixture of confusion, surprise and even anger. Humour them though, because even I reacted this way when I was told the same information. Be patient, remain impartial and explain the following important arguments against the use of evil pie charts. Fooled by an inherent trust in those at Football Manager to always get things right, despite the many examples on the contrary – who can forget Cherno Samba, Freddy Adu and Tonton Zola Moukoko to name but a few – I fell into the trap. Don’t worry though, I have been converted. Now, I know. But in Football Manager you have the numeric data. It seems the complains come more from plain pie charts that make you guess more than telling you. At least that’s all I take from all this. Yeah, certainly. The attempt was to get to a more general point on pie charts that exactly as you say, make it difficult to identify what is being displayed, more guesswork than anything. That’s what I have found it is the general danger with using pie charts, even on FM. Hope you enjoyed the post. Good article, Nassos. I hadn’t devoted much thought to it before, but it’s true that, for example, the ‘General Training Focus’ pie chart isn’t particularly useful for comparing proportions – other than to show there’s no dominant focus, I suppose. Those pie charts that compare each slice to the whole, on the other hand, do impart valuable information. In your research around the issue, did you find any good general substitute for pie charts, or is it something that has to be considered on a case-by-case basis?